The new training facility from Scarborough UTC was opened back in September 2016, with the aim to educate the engineers of tomorrow. Ensuring the facility gives students the best possible introduction to industry; they sourced machine tools, almost in their entirety, from 600 UK. 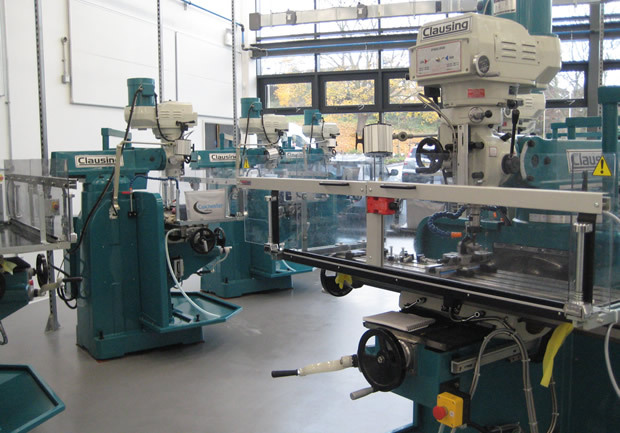 Scarborough UTC acquired Colchester Student centre lathes, a Harrison Alpha CNC combination lathe, Clausing turret milling machines, pedestal drills and bandsaws to fill the workshop, accompanied by a range of Pratt Burnerd International chucking solutions. Commenting upon the reason for choosing 600 UK, the Principal at Scarborough University Technical College (UTC), Tim Englefield said: "We wanted machines that represented the standard of machine tools that local companies are using. We wanted our learners to be able to walk out of the UTC with an education that will enable them to walk straight into a local company and feel completely at home with the technology being used. "When we look at the characteristics of a machine, it's a combination of factors that are important. As a government funded organisation, whatever we choose has to have a high 'value for money' factor. We want machines that are built to last and robust enough to take regular and heavy use from students whilst also delivering the ability to perform to a high standard." The Colchester Students have an unrivalled reputation for being the ultimate benchmark training lathes, incorporating an ideal compact footprint for an education workshop, allowing for Scarborough UTC to fit the maximum number of machines into their available space. Furthermore, these lathes are less daunting for students to learn on which helps instil confidence immediately. The geared headstock Colchester Student lathes provides learners with the very best equipment to gain industrial level training, providing a comprehensive grounding in the basics of turning. They are built to standards in excess of DIN8606 and BS4656 Part 1, which combined with outstanding safety features that exceed all international safety standards, make it a suitable education workshop lathe. Additionally, all Colchester centre lathes come fully equipped with a full range of accessories, suiting any industrial or training application. The UTC also has the Harrison Alpha 1350XS lathe with CNC capability, so students can pre-programme machines in the computer suites at the college. The Harrison Alpha CNC combination lathe has a huge range of built-in educational training options, making it the favourite choice for colleges and training centres around the world. The wide range of Alpha control options available enable learners to seamlessly progress from manual, through to full CNC turning, aided by working with conversational programming, 3D graphic displays and standard ISO programming capabilities. Additionally, all the Colchester and Harrison lathes were fitted with high quality Pratt Burnerd Super Precision manual chucks to ensure that turning operations are repeatedly made to the highest possible quality and accuracy. High value-added Clausing mills, drills and bandsaws completes the 600 UK equipment supplied to this highly impressive learning environment, making the workshop a complete 'all-encompassing' learning package for the students. The Clausing 2VS turret mills complement the Colchester and Harrison lathes perfectly and are rapidly becoming a key engineered product in the industrial milling sector and are ideal for transitioning students making the step from learning into industry. However, as with every Clausing product, the 2VS mill is one of many in a wide range of turret and bed mills offered by Clausing. Scarborough UTC chose the Clausing KC1016VS bandsaw and EKL25 pillar drills as compact, versatile, industry ready machine tools that learners could pick up and use very quickly when working on engineering projects. Clausing also supply a wide range of Clausing drills, bandsaws and grinders to suit any workshop environment whether in industry or education. All Clausing machine tools go through the same rigorous quality controls as every other 600 Group product and the mills, drills and bandsaws are no exception. The UTC model has been in operation for little over five years in the UK and the Scarborough facility is one of 48 such establishments in the UK. Scarborough UTC accepts students from the age of 14 and the students undertake the standard curriculum of maths, science and English as well as three engineering qualifications. These include engineering manufacturing, engineering design and electronics and control systems.